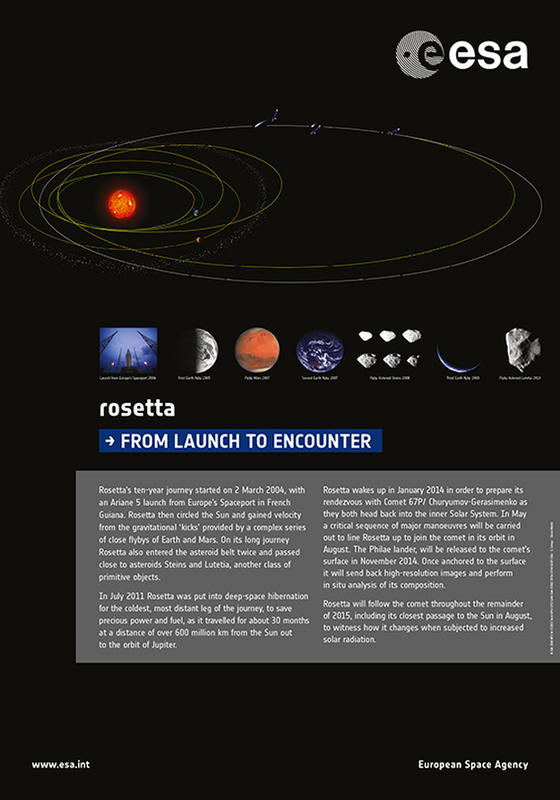 Rosetta's ten-year journey started on 2 March 2004, with an Ariane 5 launch from Europe's Spaceport in French Guiana. Rosetta then circled the Sun and gained velocity from the gravitational 'kicks' provided by a complex series of close flybys of Earth and Mars. On its long journey Rosetta also entered the asteroid belt twice and passed close to asteroids Steins and Lutetia, another class of primitive objects. In July 2011 Rosetta was put into deep-space hibernation for the coldest, most distant leg of the journey, to save precious power and fuel, as it travelled for about 30 months at a distance of over 600 million km from the Sun out to the orbit of Jupiter. Rosetta wakes up in January 2014 in order to prepare its rendezvous with Comet 67P/ Churyumov-Gerasimenko as they both head back into the inner Solar System. In May a critical sequence of major manoeuvres will be carried out to line Rosetta up to join the comet in its orbit in August. The Philae lander, will be released to the comet's surface in November 2014. Once anchored to the surface it will send back high-resolution images and perform in situ analysis of its composition. Rosetta will follow the comet throughout the remainder of 2015, including its closest passage to the Sun in August, to witness how it changes when subjected to increased solar radiation. This panel is available in a print-ready version for the format 70 × 100 cm, which can be downloaded here as a PDF. These exhibition panels were originally published on ESA's Exhibitions website.